My collaboration with Fireclay Tile is live and I could not be more excited to share the finished product with you! The "Luxe Loft" collection offers a blend of laid-back luxe using moody jewel tones and grounded neutrals. This is downtown style placed a against a backdrop of rich hues, organic finishes, and lustrous accents. A sculptural painting by the incredibly talented Sarah Lund Art (based out of Stillwater, MN) was the inspiration behind the concept. This stunning set of tiles includes a new glaze color by Fireclay Tile, Boundary Waters. The depth and richness of the color is gorgeous so definitely check it out. Read the full Story, learn some of my favorite design tips, and order samples on the Fireclay website! Lately I can't seem to get enough of earthy green colors. From my closet to my home decor....I want it everywhere! Which is why it's today's Color Crush. As I started playing around with earthy green color pairings it was hard to stop because there are so many ways to use this versatile and timeless hue. I've used Benjamin Moore paint swatches as a starting point but I also encourage you to think beyond painted walls. Experiment with these color palettes using fabrics, furniture, and accessories. 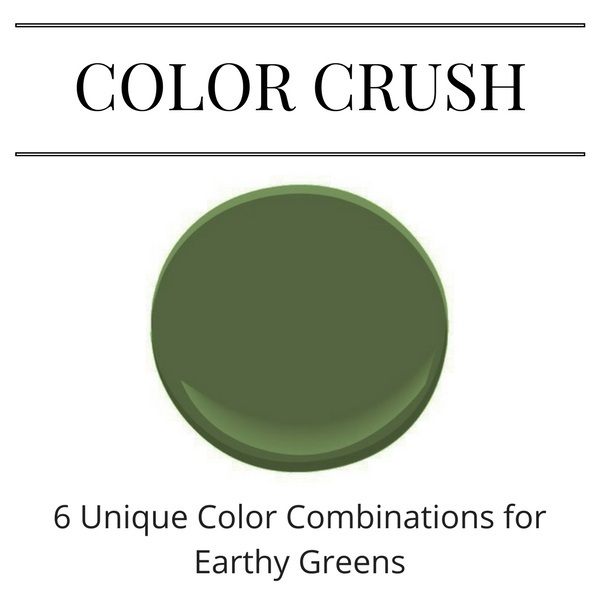 All paint colors in this post are paired with Courtyard Green (546) by Benjamin Moore. An intense blue adds a lively punch to an earthy green. This particular blue reminds me of the semi-precious stone, Lapis Lazuli, another gorgeous color found in nature. An earthy green paired with a yellow green is reminiscent of the tone on tone color palette found in foliage. Pantone named Greenery, a yellow green, the 2017 Color of the Year. Popular home decor products using this combination include palm tree and tropical prints on wallpaper and fabrics. Blush pink or "millennial pink" continues to be a popular color and it pairs perfectly with earthy greens. If you love blush pink as much as I do, check out a previous Color Crush post to see more color palettes using blush pink. Red based oranges add a zesty twist to earthy greens. This is an easy way to add an unexpected pop of color to a room. If this red-orange feels too energetic, an alternative pairing is a burnt orange with more of a brown base. Grays continue to be the neutral of choice. Try a warm gray to balance out and enhance an earthy green. A sunny yellow paired with a earthy green feels like a daily dose of summer indoors. Sunshine year-round, what more could you want? Which color combination is your favorite? How would you use these color palettes in your own home? Based on years of experience as an interior designer, I share my paint selection tips that will decrease overwhelm and ensure that you select a color you love! Painting is a relatively easy and inexpensive way to update a room. However, selecting the perfect paint color and finish can be challenging. Last week I wrote about the emotional resistance that can arise when selecting paint, which I tie to our internal fear of getting a major life change "wrong." Today I'm going to give you some practical tips, based on years of experience as an interior designer, that will help make this selection feel less overwhelming and ensure you end up with a color you love. Below are my top five designer tips for selecting paint colors. If you aren't sure which color direction to go in a room look to the colors you are drawn to in the items you already own. This could be a piece of art, an area rug, throw pillows or other accessories. Pull your favorite color from these items and start to consider the options within that color family. If you are redecorating an entire space, leave the paint selection until other major elements are selected. There are an infinite number of paint colors to select from, while items such as area rugs or upholstered furniture pieces might be more limited. Save yourself some trouble and wait until the end of your selections to select the paint. Color plays a big role in how a space feels. For example, do you want your room to feel light and airy? Go light. Or do you want the room to feel intimate and warm? If you are going for the later, consider a deep, saturated hue. This is the fun part, but have some restraint. Just because you can take home all of the samples doesn't mean that you should. The more you take with you the greater the chance you will feel overwhelmed when you get back home. Start by pulling lots of options but see if you can narrow things down before leaving the store. If you can, bring your reference point (or a photo) to the store so you can easily eliminate options that are clearly not going to work. Once you have a few front-runners, tape the samples to the wall. It's important to hang the samples on the wall because that's how you will actually experience the color - not looking from above if they are spread out on a table. Remember, adjacent colors can change your perception of a hue. Isolate the particular swatch in consideration and hang something neutral, such as a blank piece of paper, behind the swatch if necessary. Finish is both a practical and aesthetic consideration. From a practical standpoint, a matte finish is not as durable as an eggshell finish but it is easier to touch up. A finish with a higher sheen wipes clean easily but it will emphasize imperfections on the wall. With that said, paint technology continues to improve and the matte finishes are getting more durable. Showrooms such as Hirshfields are a great resource on the latest paint types. From an aesthetic standpoint using multiple finishes can create interest and variety in the design. Do a test sample on all four walls in the room you are going to paint. I recommend doing all four walls as the color can actually look different depending on its orientation in the room. Look at the samples throughout the day to see what the color looks like with different light sources (natural vs artificial) and at different times of day. Certain color undertones may be highlighted or be less noticeable depending on these factors. You'll want to make sure the color appeals to you at all times. A last piece of advice is to not over analyze. There are so many colors available it's easy to drive yourself crazy. Remember, you can always repaint! Do you plan to repaint any rooms in your home? What are the biggest challenges you face when committing to something new for your home? PS - If paint selection or other home decisions are stressing you out I share my tips to prevent design and remodeling decision burnout in a past article which can be found here. Sealed within a can of paint is a sense of revitalization, possibility, and new beginnings. Painting a room seems to be one of everyone's favorite ways to transform a room. This makes sense. Color can dramatically alter the look and feel of a space, the materials are relatively inexpensive, and, if so inclined, most of us have enough skill to complete the job ourselves. But what about the less tangible allure of a fresh coat of paint? I'd argue that sealed within that metal can is a sense of revitalization, possibility, and a new beginning. Consider when fresh paint is often applied. Often it is because a room is about to serve a new purpose. There is change in your own life. You move into your first home and want to put your mark on the space. Perhaps a room is converted into a home office where you will begin your entrepreneurial adventure. Or, the former guestroom will become a nursery where you'll spend sleepless nights, experience moments of joy as you hear a first giggle, and realize with utter frustration this tiny human does, in fact, have a mind of their own. When I look at selecting paint with my designer eyes I see the technical aspects explaining why it can be so difficult. Extrapolating how a tiny sample will appear when the color is applied to all four walls or understanding the nuances of color undertones can be tricky, but what about the emotional aspects of choosing a paint color? When there is little certainty around life changes, as there rarely is, we can cling to things we can have control over. Could it be that the pressure we put on ourselves to get our new beginning "right" transfers to a concrete decision we can make right now - like a can of paint? Does this idea resonate with you? I'd love to hear your thoughts. PS - Advice on how to select paint colors is one of the most common requests I receive. Next week I'll share my designer secrets to selecting a paint color you love. Stay tuned. Spring is here and it's the perfect time to celebrate the many ways to incorporate blush pink into your home décor. Pantone, the world-renowned authority on color, named Rose Quartz, a blush pink, one of the colors of the year. While blush pink has been identified as trending, I think it's a very classic and versatile hue. Using Benjamin Moore paint colors, I've created five color palettes centered on blush pink to get you started. The blush pink shown in the color palettes is Benjamin Moore paint color Tissue Pink (1163). Pairing colors are listed below. A crisp white and a deep warm gray take blush pink from sweet to sophisticated. Pairing black with blush pink is also a classic combination. The orange undertones of coral and a sugary punch of pink makes this soft pink look fresh and feminine. Add a masculine touch to blush pink with hunter green. Alternately, channel warmer weather ahead with a yellow-based spring green. Go bold with navy for high contrast or go light and pair blush pink with a pastel blue. In 2016, for the first time ever, Pantone selected two colors of the year. What color did Pantone choose to pair with Rose Quartz? Serenity, a light blue. The brown undertones of burgundy and eggplant add a layer of warmth of coziness to blush pink. Light pink is so often associated with baby girl rooms. While that is certainly one way to incorporate the color into your home, I hope I've shown you how adaptable the hue can be. How would you choose to utilize blush pink? Do you have a favorite color combination? Receive this content straight to your inbox! Sign up with your email address and never miss a post! .